← Out of the woods? Delivering my paper ‘Inscribing the Uninscribable’ at the ‘Manuscripts and Epigraphy’ conference (Hamburg, 15 November 2013). Travel broadens the mind, they say. This may not always be the case, but it most definitely was my experience when I was fortunate enough to attend the conference ‘Manuscripts and Epigraphy’ in mid-November, impeccably organised by the Centre of Manuscript Cultures at the University of Hamburg. The variety of topics and papers at this conference was highly rewarding and truly inspirational. Among the particularly remarkable discoveries for me at this conference was to learn of the existence of hundreds of thousands of (often fragmentary) lettered wooden tablets from Japan. These tablets, often fragmentary and never really intended to survive for a long time, are referred to as mokkan (木簡). These documents from Japan contain a wide variety of texts and serve an equally wide range of communicative purposes. Unsurprisingly, they raise the same questions about literacy and handwritten communication as the graffiti and the letters that are preserved from the ancient Mediterranean, and, interestingly enough, due to the perishable nature of the material, they also raise the same questions about modes of preservation as the wooden tablets preserved from the ancient world. Much to the entertainment of the audience (and to the bewilderment of the excellent speaker, I suspect), I was particularly struck by a set of texts discovered at the Former Imperial Audience Hall of the Nara Capital, a site that dates back to the eighth century A. D.: not only do they highlight the constants of the human experience, but they embody, in their beautiful simplicity and striking, humble straightforwardness, some of the very problems of current debate on ancient literacy. 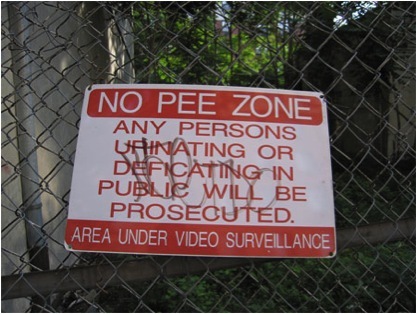 The item advises: ‘do not urinate here’, and it is thought to have been directed at the workforce that helped building the site (again, raising some interesting questions over the recipients’ assumed low ability to decipher encrypted speech). Sacred Texts or Actual Communication? 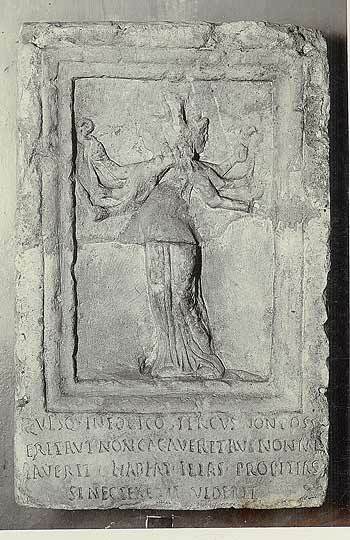 The text inscribed underneath a sculpted relief representing the goddess Hecate reads: Quisq(ue) in eo uico stercus non posu|erit aut non cacauerit aut non m|iauerit habeat illas propitias | si neglexerit uiderit (‘Anyone who has not dumped any filth in this village nor shat nor peed, may enjoy the mercy of her [sc. of the Hecate Triformis]; if disregarded, beware!’). Matters of public hygiene, combined with religiously motivated threats (especially whenever seen in conjunction with the potential desecration of loca religiosa) are not uncommon – and many a tomb inscription explicitly prohibits such activities. Is the religious context and markedness of texts like the above one from Solin/Salona the main and symbolic point – overruling the need to understand the content of the inscription itself (as would be the case with spells and curses, for example)? Classical Scholars tend to be overly (and unduly) pessimistic when it comes to literacy levels in the Roman Empire – surely there is a difference between those who could decipher a simple message (or compose one) and those who were able to appreciate the great authors of Latin literature. The same is true for the aforementioned mokkan from Japan – and this parallel becomes particularly interesting. The text from Japan is unambiguously non-religious: it is simple and straightforward, it addresses the workforce of the site, and it gives a straightforward message (which is more than what one can say for the convoluted text from Solin/Salona, for example). The Roman world, too, had such simple instructions to those who were potentially ready to foul the cityscape – and the walls of the Campanian settlement of Pompeii preserved multiple examples. Only very few of them are as complex as the one from Solin/Salona – such as the following jokey-obscene one, a poem, that, in rather remarkable Latin, purports to come from a tomb (but was actually discovered at a doorway of a house). Hospes adhuc tumuli ni meias ossa prec[antur] | nam si uis (h)uic gratior esse caca | Vrticae monumenta uides discede cacator | non est hic tutum culu(m) aperire tibi (‘Stranger, my bones beg you not to pee at my tomb: if you want to do the deceased an even bigger favour: take a dump! You see the tomb of Urtica [= ‘Stinging Nettle’]: go away, shitter! It is not safe for you to open your buttocks here!’). The same playfully obscene idea of rather intimate punishments for fouling exists in literary texts, e. g. in Martial and the Carmina Priapea. Rather more straightforward, however, are those texts that merely say ‘Shitter, beware’ (cacator, caue malum or Caue malum, cacator), attested more than half a dozen times at Pompeii (cf. CIL IV 3782. 3832. 4586. 5438. 7714. 7715. 7716). These simple texts – painted or scratched – must have been crystal-clear to its intended readership. What is interesting is that occasionally such texts (just like those against loiterers) were occasionally accompanied by visual representations of serpents and snakes (cf. CIL IV 6641 for an example to do with defecation near a street shrine). Persius, Satires 1.112-4, who mentions this practice, seems to imply that the representation of snakes creates a sacred space – perfectly possible, but surely not the first thought and immediate association of those who behold the image (or the text and the threats they contain). Two texts stating the same do not necessarily communicate the same message. The somewhat long-winded Latin poem that pretends to come from a tomb suggests may be little less than a witty joke (punning on the name Urtica ~ ‘Stinging Nettle’), whereas the shorter ones in their straightforwardness and simplicity would appear to express a desire to be taken seriously. Media matter. A complex stone inscription, with an ornate relief, conveys a different message (and may be more of a symbol than part of verbal communication) than inscriptions that focus on the verbal message alone (and potentially merely illustrate the threatening nature by means of an image). In that respect, the stone inscription from Solin/Salona may work in the opposite way from the illustrated wall inscription CIL IV 6641, where snakes are a powerful visual marker (similar to pictograms on modern signs? ), but not the main focus of the overall scenario. Simplicity of expression and a strict focus on the message appears to be the most obvious way to communicate a message that is meant to be taken seriously and adhered to by the public – this is just as true for the Pompeian inscriptions as it is true for the mokkan from Japan – the text that sparked it all. These musings raise another issue: how do texts that address a general public and wish to express a directive, in no uncertain terms, phrase this matter? Are there general politeness rules that apply? Is linguistic politeness in these matters something useful or ultimately something counterproductive? This, however, would be another blog post entirely. This entry was posted in Carmina Epigraphica, Epigraphy and tagged Carmina Latina Epigraphica, Latin Inscriptions, Linguistic politeness, Mokkan, Text typology. Bookmark the permalink.